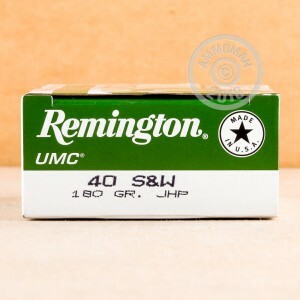 This hollow point ammunition from Remington UMC is an inexpensive self-defense option for .40 S&W pistols. 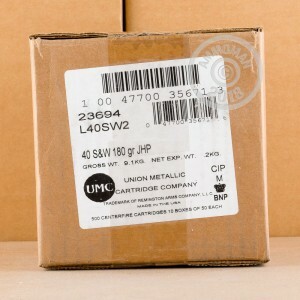 Each cartridge in this box of 50 propels a 180 grain JHP bullet to 1,015 feet per second and produces typical .40 Smith & Wesson ballistics. 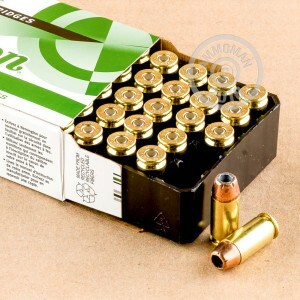 While not the latest, fanciest hollow points on the market, these cartridges will deliver strong expansion and penetration and don't cost an arm and a leg! They're also an excellent way to train with JHPs.